The administration of Azerbaijani President Ilham Aliyev has kept up the pressure on independent media in the country. Azerbaijan's National Television and Radio Council has ruled that it will ban international radio stations from broadcasting on national frequencies. The ban, which is due to come into effect on January 1, will terminate radio broadcasts by the BBC, Voice of America, and RFE/RL's Azeri-language service, Radio Azadliq. The council first announced the proposal in late October, but this ruling finalizes the decision. The council has argued that national FM and medium-wave radio frequencies are the property of the government, and as such cannot be used by international broadcasters. Council Chairman Nushiravan Maharramli defended the move, saying it is meant to bring broadcasting norms in line with current legislation, and is "in no way connected to politics." The decision is seen as cutting off one of the last remaining sources of independent news and information in Azerbaijan. Speaking in Prague, RFE/RL President Jeffrey Gedmin said the decision was regrettable and "deeply disappointing." "We are known there as a source of independent, credible, accurate news and information," Gedmin said. "This decision to knock us off the air and, by the way, others -- the Voice of America, the BBC -- is going to rob the people in this country of important information that they need to react and act on as they're leading their lives and trying to grow and build civil society." The U.S. State Department said the decision, if enacted, "will represent a serious setback to freedom of speech, and retard democratic reform in Azerbaijan." Although the banned broadcasters will still have access to satellite, cable, and Internet platforms in Azerbaijan, the ban on radio transmissions is expected to eliminate the vast majority of the stations' current audience. RFE/RL's Azeri-language Radio Azadliq, for example, is expected to lose approximately 95 percent of its audience due to the ban, despite continued shortwave, online, and satellite broadcasts. The BBC, which broadcasts in Azerbaijan in Azeri, Russian, Turkish, and English, says it will continue shortwave and online broadcasts. But BBC spokesman Mike Gardner said the decision will deprive hundreds of thousands of listeners of BBC radio broadcasts. "We will be contacting the Azerbaijan government about the status of a contract which we've recently signed, only two months ago, to build additional FM relays to improve the audibility of our services in Aqsu, Dashkasan, and Lerik," Gardner said. "But overall, we do regret this decision and we'll be making attempts to see if we can do something about it, to make sure we can get services back on for our listeners." Television and radio remain the primary source of information in Azerbaijan, where access to print media and the Internet is limited. 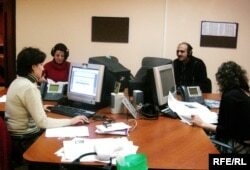 There are no independent local broadcasters in Azerbaijan. Media-watchers say the move is further evidence of crumbling press freedom in the oil-rich Caspian Sea country. Miklos Haraszti, the media-freedom representative for the Organization for Security and Cooperation in Europe (OSCE), told RFE/RL the move would have a chilling effect on the few independent journalists still remaining in Azerbaijan. "It is especially regrettable, given that in Azerbaijan we have seen a deterioration in the security of journalists due to harassment," Haraszti said. "Many so-called criminal cases have been orchestrated by the prosecutors against independent-minded print media and their editors and journalists. Many of them are even in prison." "With this decision," Haraszti continued, "the monopolization by government-friendly voices of the airwaves of the broadcast media is practically almost complete, and that's a very regrettable start to the eve of the next year." Foreign radio broadcasts first came under threat in 2006 when Azerbaijani authorities ruled that national law prohibited local radio stations from retransmitting programs from the BBC, VOA, and RFE/RL. There is obviously no need to ban any foreign radio, except to enhance and improve the control that the president and his staff already have on information in Azerbaijan. Critics say Baku's selective interpretation of existing media law violates its commitments as a member of the OSCE and the Council of Europe. Elsa Vidal of Reporters Without Borders -- which gave Azerbaijan an abysmal ranking of 150 out of 173 countries in its annual press-freedom index -- says her organization and others will petition officials in Baku to reevaluate the decision. Without open access to foreign broadcasts, she says Azerbaijan will return to the days of Soviet-style media control, when people were forced to resort to scratchy, shortwave foreign radio broadcasts to get news about their own country. "There is obviously no need to ban any foreign radio, except to enhance and improve the control that the president and his staff already have on information in Azerbaijan. It's sad," Vidal says. "We are, of course, concerned with the loss for the Azerbaijani people, who have difficulty accessing objective, neutral, and factual information, especially concerning their political life." The broadcasting ban comes as Azerbaijani lawmakers have scheduled a public referendum in March on scrapping presidential term limits. The current president, Ilham Aliyev, succeeded his father Heydar Aliyev in 2003, and was elected to a second five-year term in October 2008. The referendum, if passed, will allow Aliyev to remain in office for an indefinite term. Critics like Ilqar Mammadov, a Baku-based political analyst and blogger, say the broadcasting ban means Azeris will hear few opposing points of view in the critical weeks before the referendum -- and that the West should be more skeptical in its assessment of Aliyev's rule. "Many international democratic institutions support him and his presidency because of political pressure associated with Western energy, oil, and strategic security issues," Mammadov says. "The international community should reconsider seriously its attitude to this cruel dictatorship that does not recognize human rights in the country, violates its international obligations, and is transforming the Azerbaijan republic into a monarchy run by one family."